Pam wrote a post about how the rules are used differently at the front of the fleet vs. middle and back, and many including Abe and Paul made some good points. At Hyères, I sometimes found myself well back in the fleet. When on port and a starboard tack boat was approaching, without exception the other boat would call "starboard" as he should. On the second day, the breeze was a little lighter and I was leading after the windward/leeward. Right behind me was Peter Vessella (USA) who is really good in these conditions. I took the right gate and he thankfully followed. We were well ahead but I chose not to put on a tight cover because I wanted to beat him with boatspeed and by playing the shifts, rather than by just sitting on him. We stayed close but sailed our own race, playing the shifts differently at times. Half way up the beat, we were on port and I could see Peter 10 meters away in my window. He then edged ahead and I could not see him. A few seconds later, I heard him say, "Go ahead Doug and cross." This caught me by surprise because I did not know that he had pulled even and that he had tacked. Not seeing where he was, I instinctively bore off and ducked him saying, "Sorry, I heard you too late." Peter knew we were on a collision course and that I did not know that he had tacked. Some middle-of-the-fleet sailors use this to their advantage. Peter did not. He wanted to go left while I was going right, and this was more important than using his starboard-tack right-of-way. To beat me, he was prepared to bear off and let me cross rather than risk having me tack and mess with him. I apologized for not being able to take his offer to cross and stay ahead of him. This moment was how Peter unintentionally took the lead to win the race. While I hate missing out on a bullet at a Worlds, it's a pleasure to compete with good, gentlemanly sailors at the front of the fleet who use the rules differently. The 1996 Master Worlds were in Cape Town and there were about 120 boats on the line (this was before they split the fleets). I had never won a race at a Worlds and was surprised to be leading in the race on the second day. Defending champ Keith Wilkins (GBR) was right behind. So what did I do? I sat on him for the entire race and boy did he make me pay! We seemed to sail through every header and dead patch. I managed to hold on and win what was, until then, the best race of my life, while Keith threw out the 2nd and won the regatta. The huge mistakes I made were not working together to stretch out and not learning from Keith by letting him sail his own race. 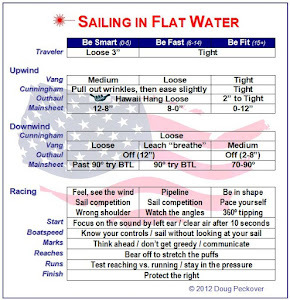 This taught me so much that it changed the way I sail and was the main reason for my win in Chile the next year. And the punishment for not working with a world champion? Being totally forgotten. Pam and I had supper with Keith and Linda in Hyères and were reminiscing about the good old days. I told Keith about this race in Cape Town and how much it meant to me. I then asked him if he remembered it. He said "no." 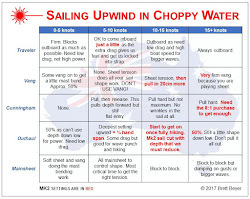 When leading around the bottom mark, you can use your advantage to point high and force other boats to tack into traffic, which would slow them down. Triple World Champ Glenn Bourke (AUS) would not do this. When in the lead, he would invite the boats behind to follow him to the right. Sure he could mess with them but he chose not to. The reason was that he wanted to keep the leaders together as long as possible so he didn't have to worry about who to cover. To make going right look more attractive, he would even foot a little so that others might think "wow, I'm pointing really well, I'll keep on going." Starting the second beat in the first race at Hyères, Roberto Bini (ITA) was leading just in front of me, had rounded close to the mark, and was pointing high. Roberto had excellent speed and I wanted to tack twice to stay with him going right but in clear air. As soon as I tacked, he tacked and match raced me for most of the beat as I tried to break free. Sure enough, the right paid and several boats passed us. As Keith Wilkins taught me, there is a fine art to staying ahead of a leader while letting him or her sail their own race and having them teach you along the way. Roberto should have used his excellent speed to lead me and others off to the right. And I should have cut my losses earlier and footed to get clear air to be able to sail my own race. The bad news is that that we should have finished 1 and 2 instead of the 3 and 7 that we got. The good news is that Roberto is a great guy and we have become good friends and will hopefully share many more experiences as the years go by. As you transition from the middle of the fleet to the front, there is a shift in the way the rules are used and applied. It may look to some like team racing but it's actually very tactical by delaying the head to head competition until the end of the race. In Hyères, in the final race that determined the championship, the front of the GM standard gold fleet sailed into the back of the GM standard silver fleet. The leaders in the gold fleet were in a close competition to win the championship and they suddenly had to contend with the back of the silver fleet. How quickly the leaders were able to transition from a front of the fleet mentality to a back of the fleet mentality, ultimately determined the winner. Anyone who was there can tell you what that sounded like. So as you move through the fleet, back to front or front to back, it's important to be aware of the nuances in tactics and how the rules are applied in different parts of the fleet. 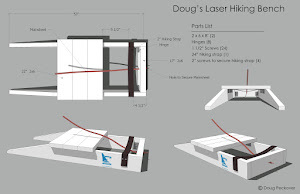 Thank you Doug, I think you are right…I am learning something from this post. I agree with your rationale , i.e. that I should not have pointed so high starting the second upwind beat to allow the followers to follow you without being disturbed and have a better control of the fleet. I wonder if there cases where this ‘loose’ control is not the better one. For example, if you are sure that the right is better (more pressure or a shift ) could not be a good tactic to point out so that the followers are pushed to tack? If the right is really paying, they should tack again after a while and you should gain something or not? 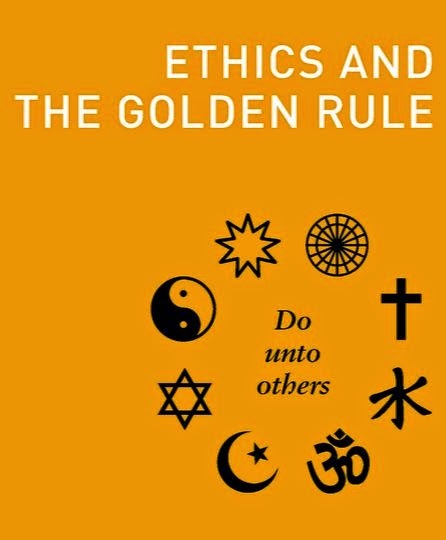 Of course your control on the followers is weaker but if you are sure the right is better it is possible the followers lost the fraction they did on a starboard tack. Am I wrong? This was not the case in Hyeres because 1) I was not sure the right was surely better at the start of the second upwind beat 2) I tacked when you tacked to control you, thus allowing the rest of the fleet to go right. I hope to sail with you again, in Canada for sure, maybe earlier? If you are sure that your speed is good then there is little need to push a boat the wrong way. This is the tactic of a world champion like Glenn Bourke. But if you're not confident, then forcing another boat to tack might make more sense. You match racing me at Hyères told me that you did not know how fast you were and/or you were not used to being at the front of the fleet. Next time, you can relax knowing that in those conditions, you are very fast! Of course, the last beat is definitely different - it's match racing against one boat or percentage racing against a group of boats.